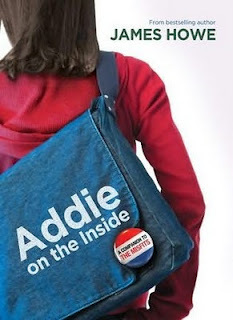 Addie on the Inside by James Howe. Atheneum Books for Young Readers, 2011. Currently available. Face Value: Even though it has that “cut off the body parts of the girl” element that can be really unappealing, I appreciate that we don’t see a face or full body of Addie. It let me imagine Addie as a girl who looked very much like I looked when I was in 7th grade (i.e., real awkward). The denim messenger bag and random political button are so appropriately middle school, and they accurately project the character we come to know as we read the book. Overall, not a splendid cover, but not a bad one either. Does it break the slate? Oh, so much. Addie makes breaking the slate her job. What I love most about Addie is that it’s not always easy for her to break the slate. Sometimes she just wants to fit in, and she aches for acceptance. But she knows that following the popular path is not true to who she is, so she goes ahead and breaks the slate anyway. Who would we give it to? This book should be mandatory reading for every girl about to enter middle school. If I had extra cash, I would just buy a case full of copies and sit at the door to the nearest middle school and hand it out to students as they enter. Not that that would look creepy, or anything. But you know what I mean. EVERYONE SHOULD READ THIS! Review: Addie on the Inside is a companion book to The Misfits and Totally Joe. It’s not a sequel so much as it is a book that takes place in the same world as the other titles. I was worried that I might feel alienated from this fictional world because I hadn’t read the other books, but I am so glad to say that I was wrong. Addie on the Inside can absolutely stand apart from its companion novels if needed – although I enjoyed Addie so much that now I want to read the other two. The book is written in free verse, and Howe plays with form throughout. Sometimes it really works and sometimes it doesn’t, but the awkward poetry was much more spare than the eloquent poetry. What was most surprising to me was how easily Howe slipped into the voice of a 7th grade girl. I’ve been the awkward, unpopular 7th grader, and Addie’s inner voice was spot on. The self-doubt, the pride, the frustration – it all felt so familiar. It’s something that every girl experienced in middle school to some level, so it was easy to quickly connect with Addie and feel invested in her experiences. There’s a lot of stuff that Addie has going on in her life. Howe takes on a lot of issues in this book: bullying, sexuality, racism, grief, puberty…it’s all touched on in some way. At first I thought perhaps it was too much, that there was no way an author could take on all of these heavy situations and adequately address them in one 200-page book of free verse poetry. But then I thought about life as a middle school student, and how it is immensely complicated, and how it feels like you are tackling a load of problems every day. Of course Addie is going to be coping with a bunch of issues, because she’s in middle school, and everything is an issue when you are that age. I thought things would be different. This relationship evolves, and it is bittersweet to watch her fall in love for the first time and then deal with the end of her first meaningful relationship. Never is the writing cautionary – Howe is not trying to tell middle school girls not to date or to not to get involved with someone from a different ethnic background. No, the writing is more illustrative in this case, and it shows the many complexities of first love and what it’s like to navigate the rigidly tiered social structure of middle school. I was thrilled to see that Howe never trivialized the experiences of middle school social and romantic relationships. Everything that Addie experienced was treated with gentle respect. Even when she was worrying about her appearance or thinking about her boyfriend, I took her seriously. That kind of approach to writing about growing up girl is Slatebreaking in itself. Addie is a super Slatebreaking character because although she has boy problems and is self-conscious about her appearance, she’s also an activist. She surpasses those typical issues that girls face during puberty, and she chooses to focus on what she wants to change in the world. She is passionate about women’s rights and equality for people of all sexual orientations. Addie starts a Gay-Straight Alliance at her school, and she works very hard to ensure that the organization is recognized and respected. It was so cool to read about a young woman who cares enough about an issue to become a youth activist. I have to be honest – Addie is kind of my hero. I wish I had been strong enough to be more like her when I was in middle school. She’s one of the most amazing contemporary teen female characters I have read. I want her to be my best friend. Thank you, James Howe, for crafting this awesome girl character and putting her out into the world! I hope that we get to read more of Addie in the future. More, please! This entry was posted in Middle Grade, Reviews and tagged Activism, gay straight alliance, Middle Grade, middle school, Poetry, puberty. Bookmark the permalink. It’s worth it! And because it’s such a compact book, it’s a quick read with great payoff. Let us know what you think of it! I really like this cover! I’ve been thinking about it, and I think it’s the hair – I feel like so often the girls on book covers are impossibly over-styled & model-y, but Addie has straight-up normal girl hair. I NEED to read this one.